Drop Button from toolbox and add ToolTip property in Button with a Message you want to show on hovering the mouse on the button control. We can add ToolTip in two ways. First button shows the simplest way to display ToolTip. 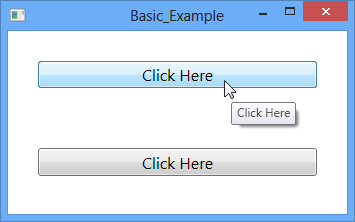 Second method is preferred for creating customized ToolTip. 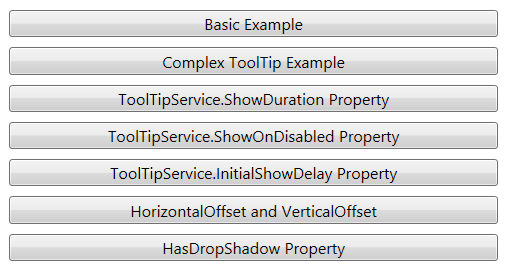 ToolTipService Class provides various properties to control display and behavior of ToolTips. Using ToolTipService.ShowDuration Property, We can set the amount of time that a ToolTip remains visible when the user places mouse pointer over the control that defines the ToolTip. Its default value is 5000 milliseconds. When Control is disabled then ToolTip does not show on mouse hovering the control. If you want to display Tooltip on disabled control(i.e. IsEnabled property set to False) than We have to set ToolTipService.ShowOnDisabled attached property to True. When user hover mouse on Button, there is a delay before the ToolTio is displayed. We can set this delay using ToolTipService.InitialShowDelay Property. We can adjust position of ToolTip using HorizontalOffset and VerticalOffset property of ToolTip. 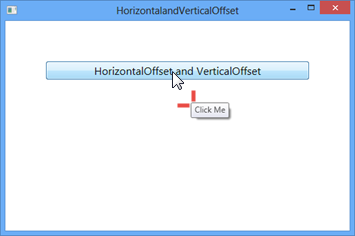 HorizontalOffset Property sets the horizontal distance between the Mouse Pointer and the ToolTip popup and VerticalOffset Property sets the vertical distance between the Mouse Pointer and the ToolTip popup. 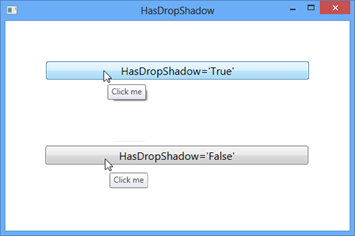 HasDropShadow Property sets the dropped shadow of Tooltip.